The premiere episode of Chaka Chak Comedy Chowk kicked off the laughter riot on COLORS Bangla, with the cast of One, including Prasenjit Chatterjee, Yash Dasgupta and Nusrat Jahan. Promising even more rib-tickling jokes and hearty moments, the Haldar family welcomes superstar Jisshu U Sengupta on Saturday’s episode of Chaka Chak Comedy Chowk. Increasing the quotient of comedy, Bhuvan, Rudranil and Kancha, will add a touch of drama to the latest episode, when they exhibit some childhood memories of Jisshu. And the list of surprises does not end there, as the audience on Chaka Chak Comedy Chowk witnessed a breath-taking performance by the specially-abled members of the Hellen Keller Institute, making the evening even more memorable for everyone. Completing the weekend family experience, with the Haldar family of Chandni Chowk, Sunday’s episode will have actor – director Raj Chakroborty along with his parents as guests on the show. 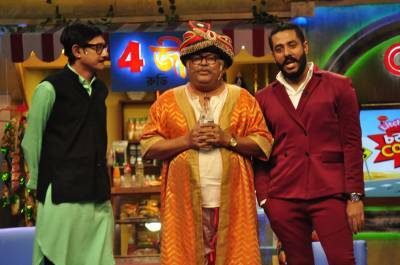 Don’t miss this humor packed episodes of Chaka Chak Comedy Chowk on Saturday, April 22 & Sunday April 23 at 9 pm only on COLORS Bangla!